Please also consider signing up for our May After Hours at Chinese Healing Arts Center here. Join us in celebrating Samuel's Sweet Shop's 25th Anniversary on April 25th. Let's give some sweet love to this fabulous local shop during our April After Hours. This celebration will also include our traditional networking event. "Since 1994 Samuel's has sweetened Rhinebeck with our classic confections, decadent chocolates, delicious baked goods & the very best cup o' Joe around! Thank you for supporting us in our mission to showcase our community's wealth of culinary & artistic talent while mentoring its youth in real world service & responsibility. We're most grateful for our partners, customers & friends, and excitedly look forward to all the fun & sweetness to come! Please join us in celebrating our 25th Anniversary!" 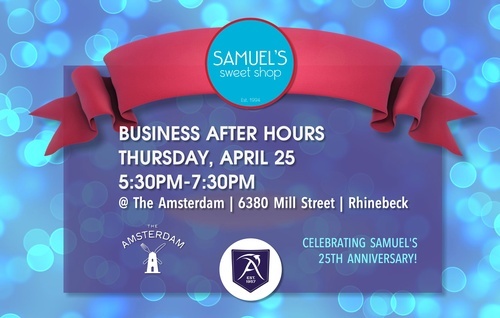 We will be at The Amsterdam with complementary hors d'oeurves, tasty sweets from Samuel's, and a Cash Bar for drinks. Bring Cash, Business Cards and Flyers!! We will be doing a 50-50 raffle to raise funds and accept donations towards our community efforts such as the Scholarship Fund, beautifying Rhinebeck, and outreach to the next business generations. The Amsterdam is the passion, and lifelong dream realized, of husband and wife owners Howard and Chris Jacobs. The Amsterdam opened in Spring 2017 in the heart of Rhinebeck, serving contemporary farm-to-table fare in a beautifully renovated city-meets-country space. In its first year The Amsterdam was named Best New Restaurant by HV Magazine and instantly became a local favorite, as well as a destination in the region. In early 2018, Executive Chef Alex Burger joined The Amsterdam team – from legendary French chef Daniel Boulud’s restaurant group – furthering the Jacobs’ commitment to being the best possible version of their Hudson Valley dream restaurant. As we are expecting to fill the room drop-ins may not be possible for this event, please sign up ASAP if you would like to attend.